Over Christmas I came across an illustrated map that suggested the Deerpark in Faithlegg is dating from the time of the Norman manor, specifically from the 14-15th Century. I have to say I was surprised at this and in the last few weeks I have been up there more and more, and thinking about the implications. The source for this was the Atlas of Irish Rural Landscape. And it lists Deerparks from around the country, of which Waterford can claim only a handful, see map below. Now the Atlas has no further details and also could be wrong. I had always believed it was part of the Demesne constructed by Cornelius Bolton Jnr in 1783 at the time that Faithlegg House was constructed. At that time extensive planting and development occurred in the parish, noted for example by Arthur Young in his ” A Tour in Ireland” and who I have mentioned before and indeed, will again. Deerparks were a feature added over many centuries in Ireland, but started initially with the Normans. They were primarily a source of food, along with other features around the manor like rabbit warrens, dovecotes and fish ponds. The Deerparks were generally sited in an outlying position on the manor, but no further than a mile away. They were mostly earthen embankments with an internal fosse topped with a timber paling fence but stone was used where it was available – the situation in the area of Faithlegg (or possibly the walls were built at a later stage by the Boltons?). Although some used them for supplying animals for the sport of hunting, it was generally for food, and apparently the keeper could supply venison to those favoured by the lord of the manor on presentation of permission slips. Venison was a meat for special occasions and their was prestige attached to its eating. The sites were no more that a few acres and were generally on poorer land, with grass, scrub and some trees. The Normans introduced fallow deer to Ireland, in particular for the parks, as they could endure indifferent land and were good breeders. In time the deerparks could be turned to pasture for dairy, beef herds or horsebreeding, and many disappeared in the creation of landscape parks in the Eighteenth century – which indeed was the style under which Faithlegg House was created. This new information suggests that the Deerpark name, and the remaining walls could possibly be as old as Faithlegg Church, making them the oldest built structures existing in the area. This begs a question, what can we as a community could do to investigate the provenance of the site and highlight and preserve such a potentially important historic feature. Another issue is that the name of the Deerpark seems to be falling out of favour with Coillte. Some years back a sign was erected that called the area Faithlegg Woods. The sign has now been replaced but the name remains. Perhaps a map of the beautiful walks in the area could be provided, with the historic placenames of Deerpark, Minaun and Glazing Woods highlighted. This would be a positive step, but in light of the age and significance of the site, perhaps much more could be done to interpret and preserve this important heritage site. They say no one ever remembers the runner up. 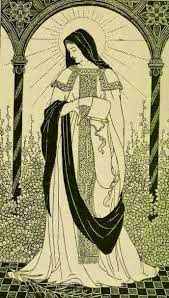 St Ita seems to be such a person, often described as the Bridgid of Munster, highlighting her position in the pantheon of Irish female saints, a close second to Bridgid of Kildare. So unlike Bridgid who’s life and times are widely known and even covered in the national school curriculm, Ita, un-befitting her status in my view, seems to have been ignored, and except where there is a direct connection, practically forgotten. 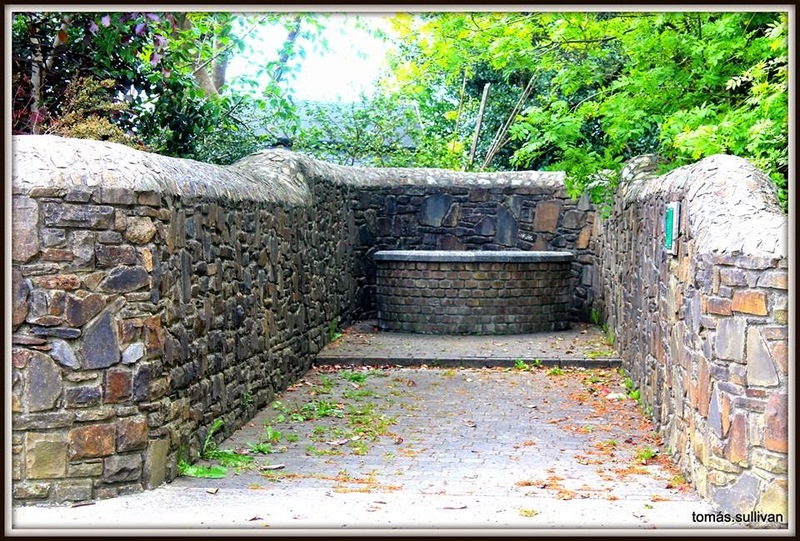 St Ita of course is relatively well known to us here in Cheekpoint and Faithlegg as the Holy well at the church is dedicated to her. Up to the early part of the twentieth century there was an annual pattern on her feast day – January 15th. The well was a simple hole in the ground marked by rock, one of which had a small recess, said to be the footprint of the infant Jesus. As a child we could visit it, by jumping over the wall below the church, but then it was often trampled on by grazing cows. The De Las Salle order owned the land at that stage. At the time of the building of the houses and golf course by McInerney construction, local pressure protected the site, and its from this time the present “romanticised” version stems. But who exactly was this early Christian saint that has an association with Faithlegg? There are many differing accounts of St Ita to be found via google which you could view for yourself. I purchased a book called St Ita, The Forgotten Princess, by James Dunphy some years back which has a lot of interesting information, particularly about her connection with the Deise, but he prefaces his account thus: “I am not suggesting to anyone that this is all proven fact, but I offer it to those of an open mind as a representation of the life of St Ita” p4. Dunphy and other online sources state that Ita was born Princess Deirdre, to King Kennoelad and Queen Necta of the Deise tribe in Waterford in and around 470AD (again much variation). Her birth place is not certain but it is speculated that it was in or around Ballyduff, Kilmeaden. 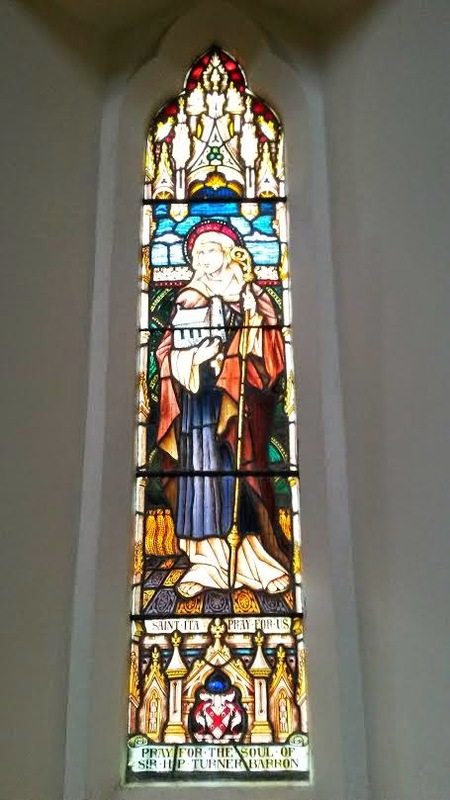 According to Mossy Hunt in a history of the parish church of Clonea “in the Waterford region she is commemorated in several placenames: Kilmeaden, (Cill Mo Íde ín – Church of my little Ita), Kilbarrymeaden (Cill Barra Mo Íde ín – Church of my little Ita’s height) and Ita’s well between Kilmurrin and Boatstrand.” p14. I wonder how many more have been lost. Interestingly no mention of a Faithlegg placename here, though he does speculate that she was born at Faithlegg. Something that is repeated in some online accounts. She travelled throughout the Deise area and appears to have studied or at least spent time in Ardmore, Clashmore and Lismore, and eventually she settled down in Killeedy in East Limerick where she founded her monastery. There she ran a school which was responsible for the teaching of many early churchmen and women, including my own (and apparently her) favourite St Brendan the Navigator. So many passed though her hands that she earned the nickname “foster mother of the saints of Erin”. It is said, and I don’t know how anyone could disagree, that Ita thought Brendan all he would know about boats and seamanship based on her early upbringing around fishermen here in the Deise. Her connection with Faithlegg is puzzling. Although some have said in publications that she was born here, there is no oral evidence or tradition of it in the area. A plaque at the well, written by Julian Walton (if memory serves Julian covered her story in On This Day Vol I but I can’t locate my copy at the moment), speculates that her name, which would have been widely known in the early Christian era, was used as a marker by the Deise, to clearly designate their territory to passers by. There are a few points I would yet like to explore however, for example the proximity of Faithlegg to another important early Christian settlement, Kilmokea in Great island in Co Wexford (2 miles away via boat) . Another curiosity (and perhaps just a coincidence) is that both Faithlegg Church and Ballyduff Church are both dedicated to St Nicholas, could there be a connection? Finally, the Barony of Ide sits across the river from Cheekpoint in the South East of Kilkenny, again something I have yet to explore. Ita died on the day that would become her feast day 15th January, perhaps in the year 570 (at least according to Wikipedia). For a lady with such a history and connection with the Deise it’s a shame that not more is made of her connections to us here, her life and her works. I certainly look forward to researching her more. All, all of that virgin’s love. I later read an account of the incident in my grandmothers weekly copy of the Irelands Own and my jaw fell open. The account is now freely available on the internet, for example here and there are many different accounts but the version I know, as told by my Father, was as follows. The Earl of Sandwich departed in the winter of 1765 from the Canary Islands bound for England. On board was a cargo of wine and other general freight, but it was a man by the name of George Glas that was most significant to what would unfold. He was an adventurer and privateer who was returning to his home country with a fortune collected from years of being abroad and travelling with him was his wife and daughter. The ship was commanded by a Captain Cochrane, which he and the crew had to battle hard through winter storms across the Bay of Biscay. Sometime in November the ship arrived off the Waterford coast near to the Hook and it was at this stage that four of the crew turned from sailors to pirates. My Father couldn’t say why, but he guessed one, if not all of them had sailed with Captain Glass before and knew what he was stowing aboard. However they knew, they must have plotted the whole trip, planning for a time that would be ripe for the taking of the ship. The attack was swift and as they slit throats, or ran them through with swords, they tossed their fellow passengers and crewmates over the side. Once free of interference they set to gathering their booty and celebrating their good fortune. Realising that they needed to get away from the ship with their spoils they launched the ships tender but the gold they had gathered could scarcely be contained safely aboard. There was also jewels to be carried and a measure of gold ore. They scuppered the ship and pushed off, and rowed hard for the nearest landfall which was inside the Hook at Templetown. Hauling the tender up on the shore, they hid the boat and most of the treasure before walking to the local Inn for food and beer. Apparently the four strangers caused some suspicion by their arrival, which was heightened by their ability to spend Spanish gold. They left earlier than they had planned as they were conscious of the suspicious looks and returning to their boat, retrieved both it and the treasure. They buried a sizeable portion (some say all of it) and departed upriver, hoping, my father said to blend in and cause less suspicion in the port, where hundreds of sailors would be gathered. Next day they arrived at New Ross and quickly found an Inn to put their heads down and quench their thirst. (My father didn’t mention female company, but it must have surely been a factor!). The four strangers continued to arouse suspicion however, such was their ability to spend money and it was at this stage that misfortune struck them. Their ship the Earl of Sandwich, which had been scuppered and presumed sunk, had in fact stayed afloat and washed up on the coast of Waterford. The authorities were most perplexed by the ship with no crew and customs officers along the coast went in search of the ships tender and potential survivors. Word of the four sailors spreading largess at Templetown reached their ears and a manhunt ensued. Some say they were captured at New Ross, but my father said no, they fled downriver, heading back to retrieve their treasure and to hopefully catch a ship outward bound. The authorities chased them down at Fisherstown bank where they were rescued from a sinking boat, having pushed off from the shore at the sight of the onrushing troops. Apparently they had stashed some of the money on the shore and were disturbed having just retrieved it. Some of the gold went down with the boat and my Father said there was many the beam trawl was set on Fisherstown bank for years after in the hopes of dragging up Spanish Dollars. Once returned to New Ross the pirates were “interviewed” and following this a search of the beach at Templetown yielded over twenty bags of gold. An account here. It is the origin of the placename and popular swimming place – Dollar Bay! The men might have hoped for leniency having given up the treasure but instead they were sent to trial in Dublin, found guilty and sentenced to death. They met their fate with the hangman and their bodies displayed as a warning from the quayside at Poolbeg. The question remained however, was all the treasure retrieved. My father said that for years after men searched the shoreline between New Ross and the Hook on both sides in the hope that the pirates had hid more. A story persisted in Cheekpoint of suspicious lights being seen on Ryan’s shore, or voices of foreigners carrying up from the shore in the night, at the time of the pirates journey in their boat of gold! It was considered plausible that the canny pirates had stashed part of their haul in various locations to maximise their chances of retrieving the hoard. For the winter solstice this year we decided to do something we had never done before; walk to the Minaun and welcome the rising sun as I imagine our forbearers in the distant past had. I have to say I was nervous that anyone would be interested to come along, and the feedback beforehand wasn’t very positive, even with an offer of hot fruit punch or damson vodka! Nevertheless once we arrived at the departure point, it was heartening to see a few brave souls and by the time we left there were 15 in total and everyone seemed in good spirits. The walk up was filled with early morning chat, and although it wasn’t very taxing, I think everyone was glad to pause at the Parcin before broaching the summit. It’s a reasonable climb, but when you’re talking as well, it can take it’s toll. We arrived at Cromwell’s rock just after 8 and had plenty of time to the see the rising sun brighten the Wexford horizon, although the low lying cloud and drizzle conditions didn’t bode well. I was conscious of not wanting to say too much, there’s something about silence that is fitting at dawn. 8.35 was sunrise but alas, the sun couldn’t peep through those gloomy clouds. A disappointment no doubt, made worse by the spectacular showing in the days before and for a few days following. Walking back the feedback was positive, and I think our neighbour Jacqui summed it up very well with her perspective, it’s not about actually seeing the sun, but the social aspect of getting out of the house and going for a walk with neighbours and friends. Our good pal Bob the scientist celebrated the solstice with his family as well and blogged on the merits of walking in company or indeed alone. In it he refers to Gods light and captures some sense of why we love to be out. The piece reminded me of the joy of being immersed in nature, but also that it’s a resource freely available and much in demand. The irony isn’t lost on me in trying to drum up business for guided tours. From a purely economic perspective I must say I’ve made some questionable choices in life – a fisherman, men’s outreach worker, a community worker, childcare sector and now a walking tour guide, a pastime freely available to anyone with a decent pair of boots! In the attempt to raise our profile/drum up business I’m conscious of the time given each week to social media, either the posts to facebook (on average one a day since we started the business) and a weekly blog post. The time taken to put these together and further monitor and respond is time-consuming and at times you wonder what’s the merit. The flip side is that the photos required, encourage us to get outside all the more and seek regular and topical content. Another positive I suppose is that social media is a form of modern communication which brings people with a connection to the area a slice of the village on a regular basis. Thinking back on what Jacqui said, could there be any more fitting welcome to a new year ahead, than a gathering within your community to celebrate the coming of brighter days, and get fresh air and exercise while you do it. So happy new year and I hope it’s a healthy and prosperous one too.